Restoration work has begun at the Mar Behnam monastery ! 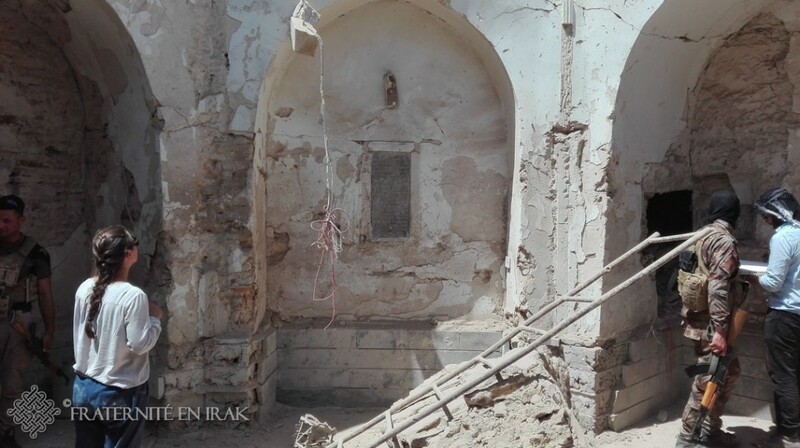 HERITAGE – For several months, Fraternity in Iraq has been preparing the reconstruction of the Mar Behnam monastery, destroyed by ISIS in 2015. This 4th century martyr’s tomb is a popular place pilgrimage for Christians, Muslims and Yezidis. Here is a story of the first works on this unique landmark of the Iraqi heritage. The ruins will soon be a distant memory… At any rate, this is the hope shared by the entire team in charge of the reconstruction projects. Mar Behnam’s tomb (or « martyrium ») is a highly symbolic place for the Church of Iraq but also for the main communities of the country. Therefore Archbishop Petros Mouché, the Syriac-Catholic bishop in Mosul, has entrusted Fraternity in Iraq with the task of helping him to rebuild it. Fraternity in Iraq gladly engaged in the project. 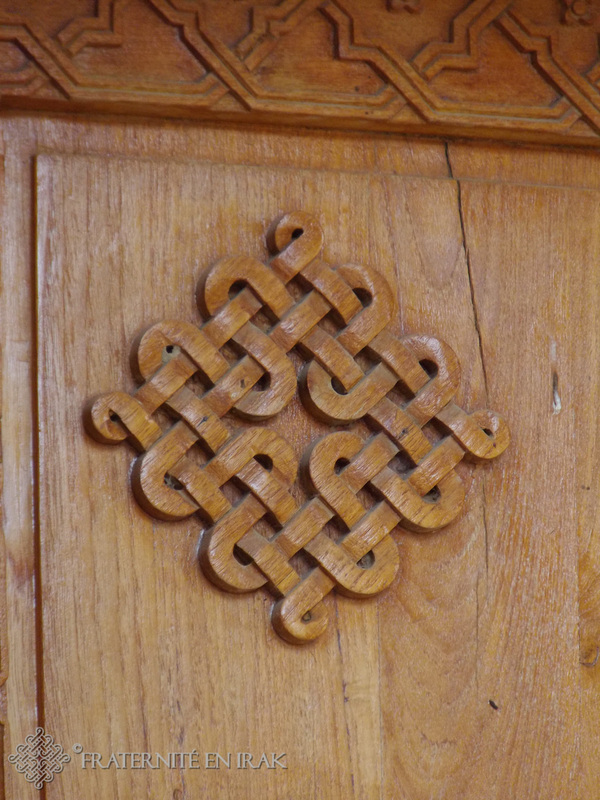 It is a foundational place for the NGO, whose members visited several times between 2011 and 2014, and whose logo – the braided cross – is directly inspired by those that used to adorn the doors of the chapel adjoining the tomb before ISIS hammered them. 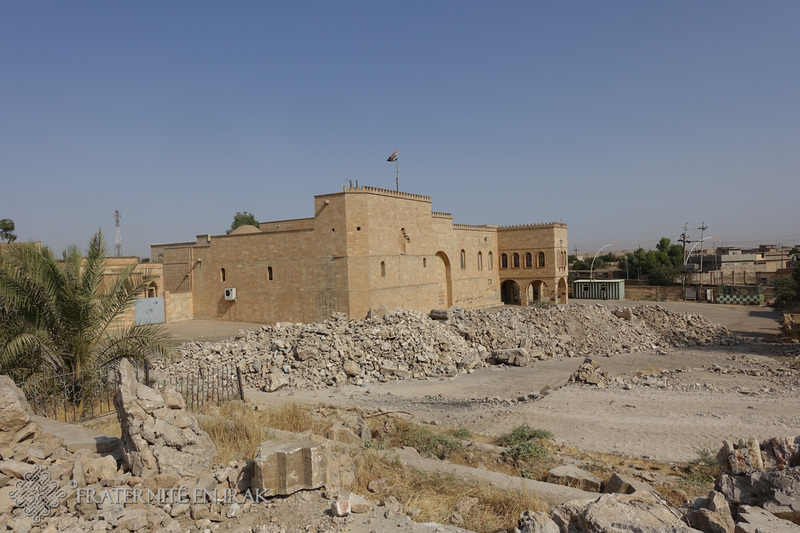 Located in Khidr, around 12km Southwest from Qaraqosh, it was built in the fourth century on the place where Mar Behnam and his sister Sarah have died, and the martyrium hosts their relics. Those two saints had been killed by their father, King Sennacherib, because of their faith, and are believed to be at the heart of the conversion of Assyria to Christianity. 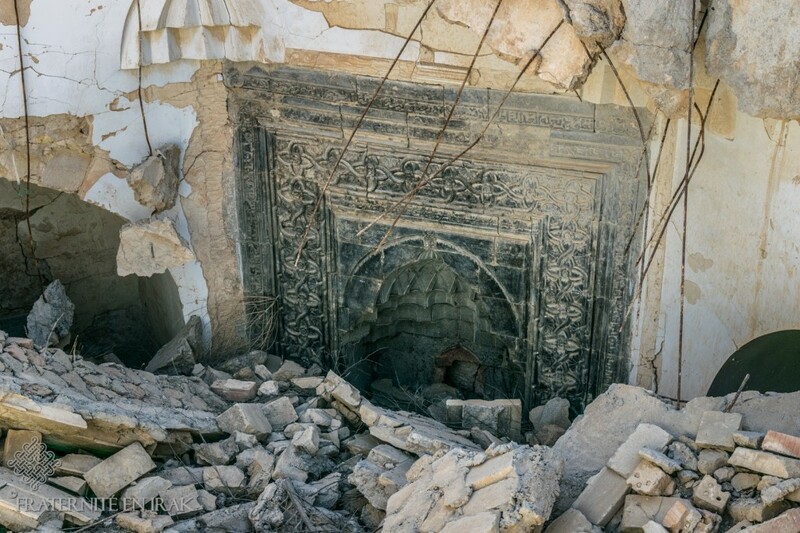 ISIS’s jihadists blew up the mausoleum in March 2015, and claimed responsibility in a video. Rebuilding this mausoleum where Christians, Sunnites, Shiites and Yezidis used to come on pilgrimage means allowing all these communities to meet again and bring down the walls that ISIS has tried to put up in order to divide the Iraqis. At one of the meetings organised around Bishop Petros Mouché and Khidr’s Muslim mayor, we asked how much the removal of the rubble resulting from the explosion would cost. At first, when he replied « ala ahsabi », the members of the Brotherhood with Iraq thought they had misunderstood: it meant that he would assume the costs of that work, which proved his attachment to the sanctuary! 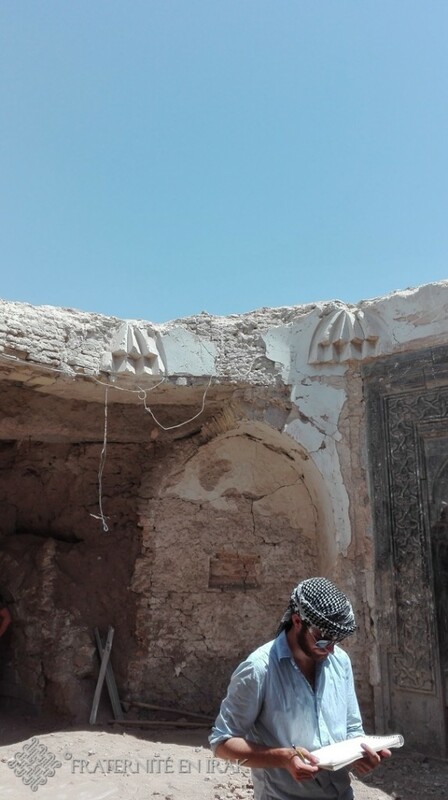 Thus eight workers have been working for more than a month under high temperatures, clearing block after block the sanctuary where Mar Behnam is venerated. The fact that inhabitants of Khidr – an almost entirely Sunni city – are doing this hard work illustrates how dear this place is to the people of the south of the Nineveh plain. It is therefore an important landmark in all respects: patrimonial, religious, and that fosters reconciliation between the communities of the Nineveh plain. This work requires specific skills. This is why Fraternity in Iraq has commissioned a team of experienced architects who, free of charge, endeavour to draw the current plans (after destruction) and the original plans (before destruction) so that the mausoleum can be reconstructed to its original looks. … and freehand drawing ! Some prerequisites were essential, prior to the reconstruction of the tomb. Mine-clearing first, since nineteen 20kg-jerry cans of unexploded TNT were discovered while clearing the rubble… Those nearly 400kg of explosives could have annihilated the whole lower part of the tomb. Inexplicably, thanks to a fault in the firing of those jerry cans, that part of the mausoleum has been preserved. Workers from the neighbouring village then quickly completed the clearing of stones and rubble throughout the mausoleum. Empty rooms and halls on the ground floor of the convent were requisitioned to store and sort the stones and debris, in order to number and list the reusable elements. 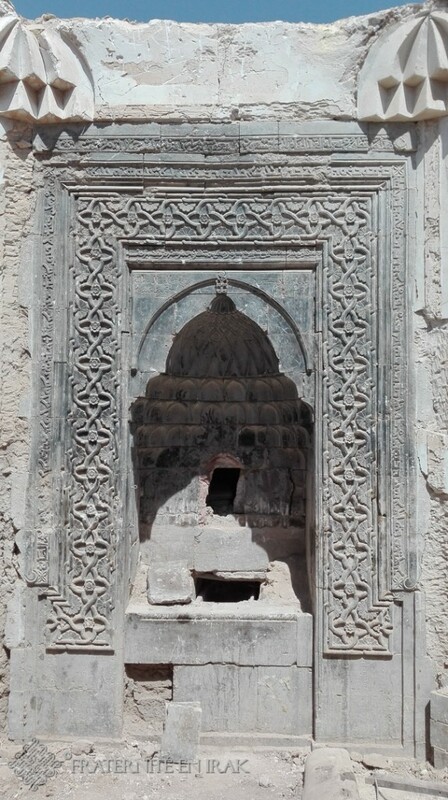 The niche that contains the relics of Mar Behnam: before and after clearing. 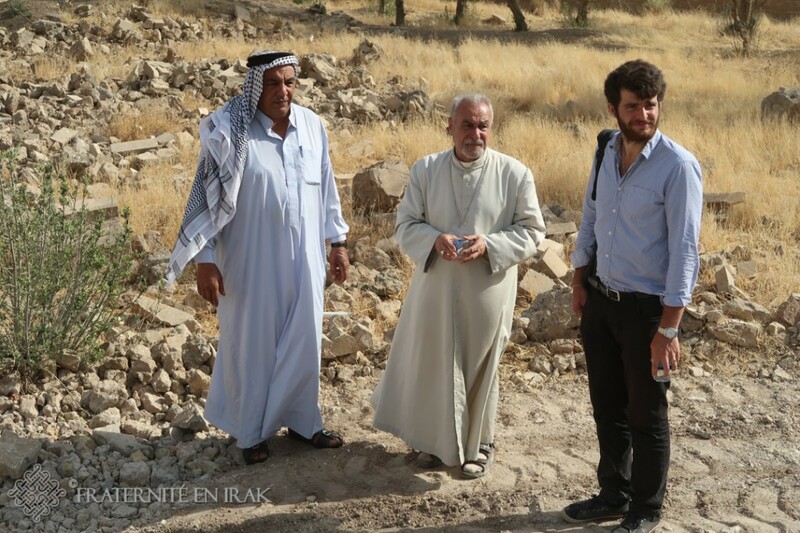 Concurrently with the follow-up of the clearing works and with the inventory of the parts found in the rubble – led by an Iraqi archaeologist – the architects of Fraternity in Iraq are conducting historical research to prepare for the future reconstruction. The aim is to rebuild on sound historical bases : study of existing archive documents, constitution of historical records from the old photos in order to spot what was damaged and what is missing… Thanks to this work the architects of the association will be able to draw the new plans and elevations of the building. 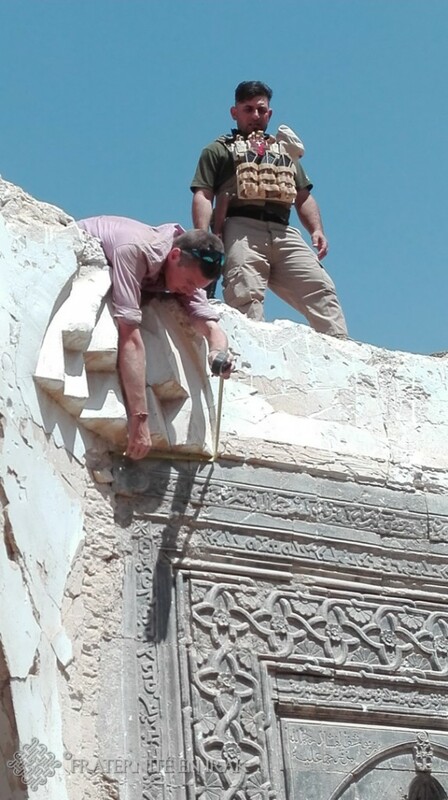 The Brotherhood with Iraq has also called upon a renowned Iraqi archaeologist who knows the intricacies of local construction. The purpose is to reconstruct as much as possible from the existing – bricks of terra cotta extracted from the rubble – or to have some remade to the same dimensions by a Qaraqosh craftsman. 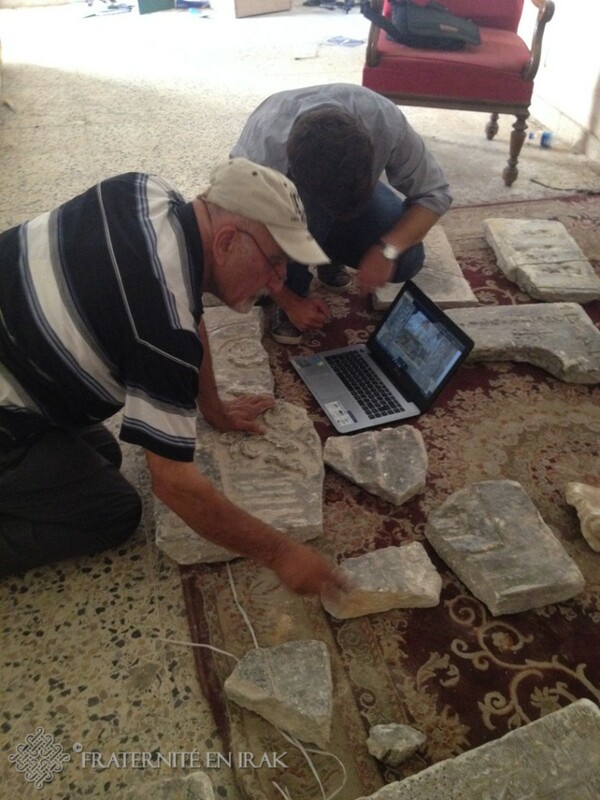 Fraternity in Iraq’s architect, Guillaume, at work with the archaeologist. 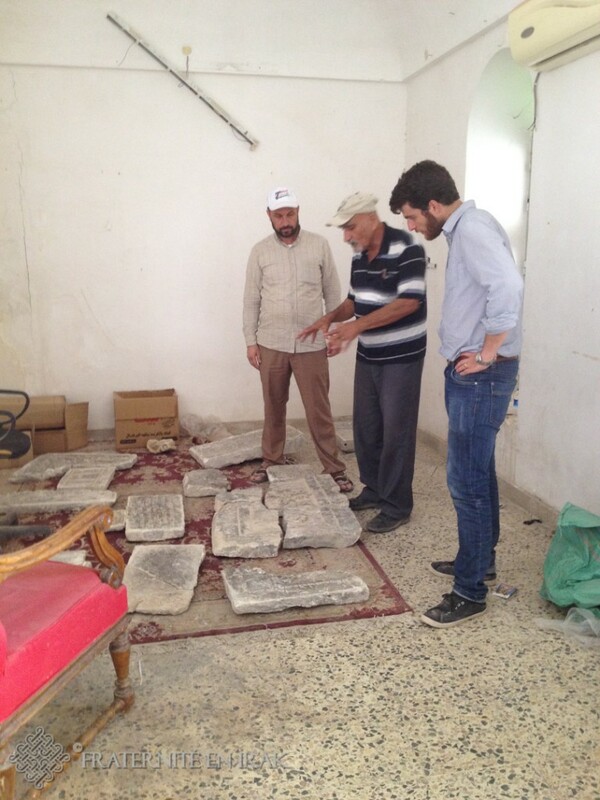 The stocktaking of the marble plaques containing inscriptions began with the Iraqi archaeologist who has agreed to help us. Under his direction, the 600 square meters of rubble have to be sorted again in two weeks by a team of five workers, in order to set aside all the parts that can be reused or need to be saved: ancient bricks, carved stones and possibly tiles. The actual reconstruction will then begin with the dome and interior vault of the tomb room. The research effort in order to understand how it was built is underway, bearing in mind that it has been rebuilt or raised several times during the 20th century! The aim of Frtaernity in Iraq’s architects is not to use concrete but rather to use traditional Iraqi of brick dome building techniques. 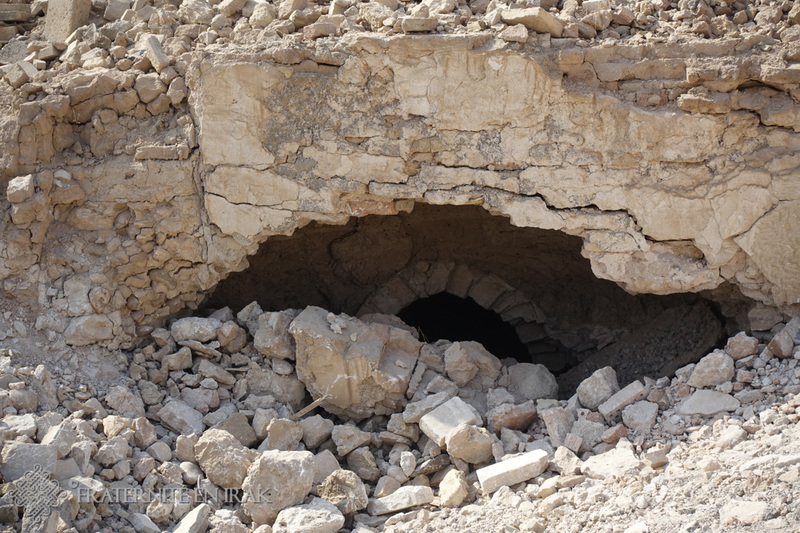 Thereafter, the two tunnels that grant access to the tomb, heavily damaged, will be reconstructed. Once the layer of dirt that covers it is removed, the remaining parts of the two tunnels must be disassembled and reconstructed identically. As a matter of fact, those underground entrances contribute to the symbolism of the place significantly: going underground, the pilgrim used to « bury the old man » before being reborn and coming out again, being spiritually resourced. The remaining amount of work that lies ahead is immense. The church of the convent and its hundreds of stone sculptures will have to be restored and finally the reception building, which was destroyed by the explosion, will need to be rebuilt. 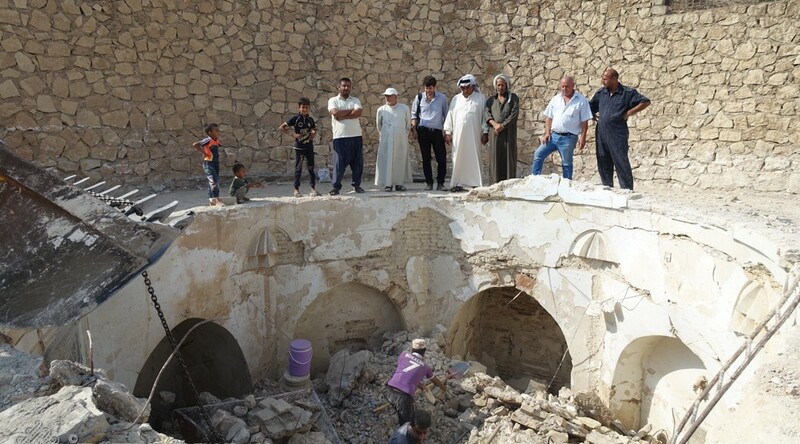 Without forgetting to temporarily cover the tomb room, with a roof on which one of the Qaraqosh artisans sponsored by Fraternity in Iraq’s economic recovery support program is about to work ! This medieval monastery is not only a sanctuary for Christians, Muslims and Yazidis, its architecture and inscriptions also reveal the cross-cultural influences of the different civilizations and religions at that time. Help us revive this historic convent !